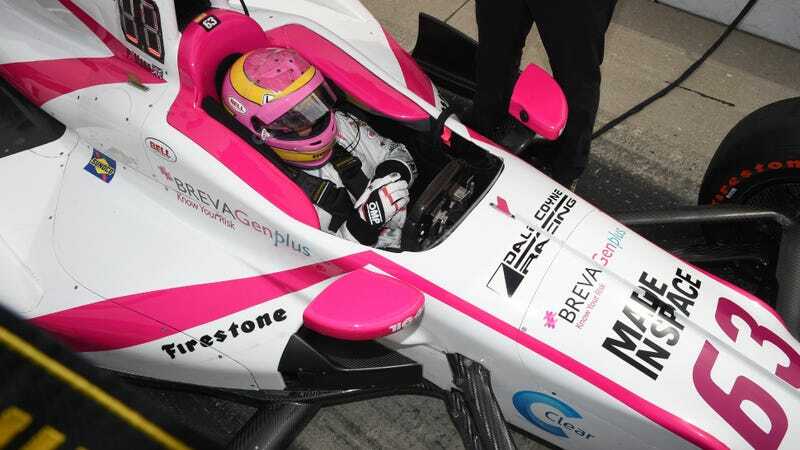 Pippa Mann, the fastest woman to race at Indianapolis Motor Speedway, is opposed to the FIA’s appointment of Renault test driver Carmen Jorda to their Women In Motorsport Commission, and for very good reason. Recently Jorda has indicated an interest in creating what amounts to a ‘separate but equal’ Formula 1 series specifically for women, and does not believe that women can compete on a level playing field with men at the height of open wheel racing sport. As it happens, Pippa’s opinion is in perfect alignment with Alanis’, because of course it is. On the night of the announcement, Mann took to twitter to express her displeasure with Jorda’s appointment. Since then, Pippa has had the uproariously loud support of women in motorsport backing her up on twitter. In fact, this simple poll from Motor Sport Magazine on twitter might be the most telling. One particularly vocal woman standing behind Pippa is race engineer Lena Gade, who has worked incredibly hard to get where she is, revered as among the best endurance racing engineers in the business. Gade currently serves on the commission herself. We saw a lot of other female racers stand up earlier this fall when Carmen made her comment that she does not believe women can be equal. Obviously that’s not what most of us feel in the sport, however to see someone with that opinion elected to this position to represent women in motorsport on the FIA Womens’ Commission was disappointing. Jorda’s words don’t seem to reflect the success that women have found in motorsport, fighting for position directly with men, in recent years. In IMSA competition or example, Christina Nielsen recently won her second championship title, and Katherine Legge won multiple rounds of the series teamed with Andy Lally. And if you look to drag racing, a seriously competitive club of mostly men, Brittany Force just won the 2017 Top Fuel championship. Women don’t need their own open-wheel racing series. Give women a support structure in racing, provide them the resources they need to succeed, and I fully believe that they absolutely can and will. Motorsport can certainly be inclusive if we want it to be.